Cheer your favorite team on to victory with our Football Field Dessert. Our Football Field Dessert is the perfect centerpiece for the big game day. Pour milk into medium bowl. Add dry pudding mix. Beat with wire whisk 2 min. ; set aside. Spread cake cubes into bottom of 13x9-inch dish; sprinkle with chopped candy. Top with pudding. Remove 1/2 cup of the whipped topping; cover and refrigerate for later use. Tint remaining whipped topping with desired amount of food coloring; spread over pudding. Refrigerate at least 1 hour or until ready to serve. 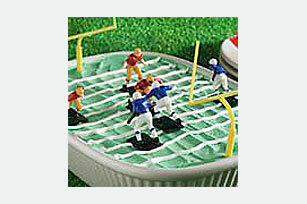 Pipe reserved whipped topping onto dessert to resemble the yard lines of a football field. Use the remaining whipped topping to draw a football in the center of the field. Cut into 16 squares to serve. Store leftover dessert in refrigerator. Celebrate the big game victory with a serving of this special dessert. Place unopened tub in refrigerator. An 8-oz. tub will be completely thawed in 4 hours. Do not thaw in microwave. Insert decorating tip in pastry bag or small plastic food bag. Fill with thawed COOL WHIP Whipped Topping. Holding bag firmly, squeeze topping down into tip. Twist end of bag to keep topping contained, then guide tip to decorate.